A small portion of the Center as it looks today. 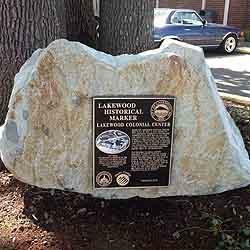 When the Lakewood Colonial Center was built in 1937, it was known as the Lakewood Community Center and represented a new way of life for the Lakes District and the American people. It was developed on this site, a sparsely settle section of prairie land at the time, by Norton Clapp and the Lakewood Development Company. It was the first suburban shopping center west of the Mississippi. 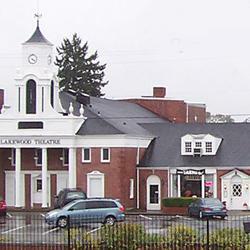 The original Colonial Center included a theatre, grocery store, pharmacy, dental office, and other shops. An additional section with 11 stores was added to the central core in 1951. The final complex with 14 more stores was added in 1955 on the north side of Gravelly Lake Drive. By 1962 there were 32 stores and services in the greater Lakewood Colonial Center.